Pactech is offering next day shipping on custom FlexLite cables. These ethernet cables are ultra thin 28AWG stranded with LSZH/PVC jacket. 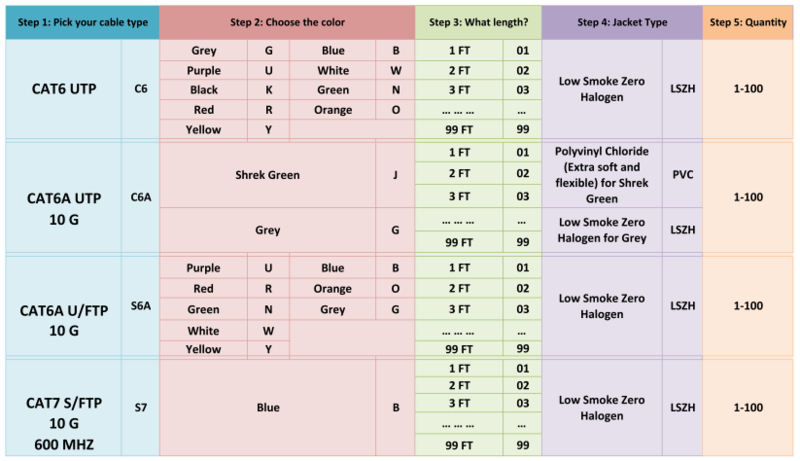 The chart below gives 5 easy steps to create your own customized FlexLite cables. You will have the option to pick the ethernet type, color, length, and quantity. (More specifications included in the link under the chart). Pactech is giving the flexibility for customers to get the perfect ethernet cable the next business day. Order must be placed by 1:00pm PST Monday to Friday to be shipped out the next business day. The maximum order per customer is 100 cables per day. Please use the Order Form at the bottom to place your order. Customers can use Credit Card, PayPal, or qualify as a termed customer. If you need help placing an order, you can contact us through our customer service at (408) 526-9363 or simply emailing us at sales@pactech-inc.com.